Most successful start-ups and tech companies are thriving because of their patents and intellectual property (IP). 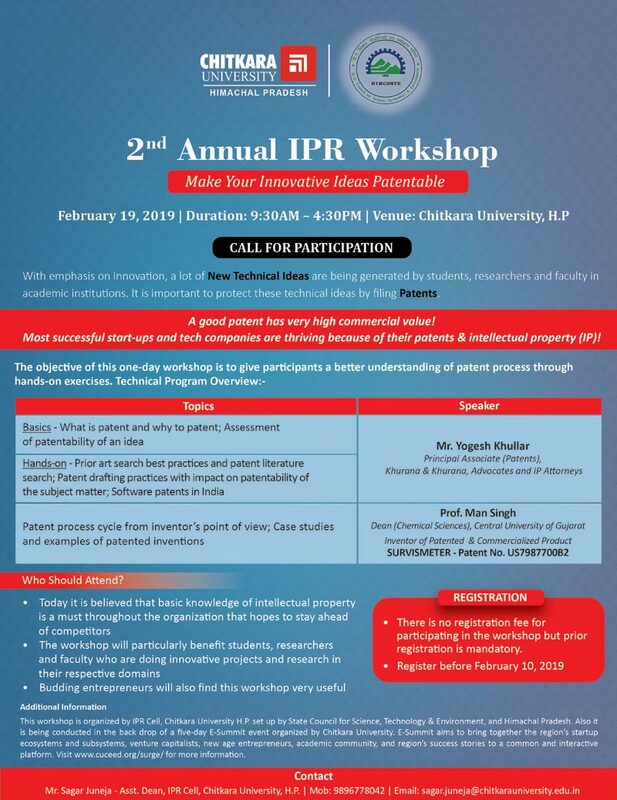 The 2nd Annual Intellectual Property Rights (IPR) Workshop on the theme ‘Make Your Innovative Ideas Patentable’ aims to give participants a better understanding of the Patent Process through hands-on exercises, will be held on February 19, 2019, at Chitkara University, Himachal Pradesh. With an emphasis on Innovation, a lot of New Technical Ideas are being generated by Students, Researchers and Faculty in Academic Institutions. It is important to protect these technical ideas by filing Patents. There is no registration fee for participating in the workshop, but prior registration is mandatory. This workshop is organised by IPR Cell, Chitkara University H.P. set up by the State Council for Science, Technology & Environment, and Himachal Pradesh. Also, it is being conducted in the backdrop of a five-day E-Summit event organised by Chitkara University. E-Summit aims to bring together the region’s startup ecosystems and subsystems, venture capitalists, new age entrepreneurs, the academic community, and the region’s success stories to a common and interactive platform. Visit www.cuceed.org/surge/ for more information. Mr. Sagar Juneja – Asst. Dean, IPR Cell, Chitkara University, H.P.